Since the opening of the Panama Canal in 1914, virtually all ships have been constructed to fit within its locks. 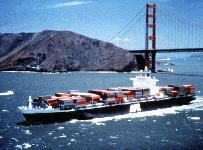 Conventional wisdom favored flexibility, so ships were never more than 91 feet wide or 1.000 feet long. And because these "Panamax" ships could transit the canal, they could be deployed in either the Atlantic or Pacific as market conditions changed. 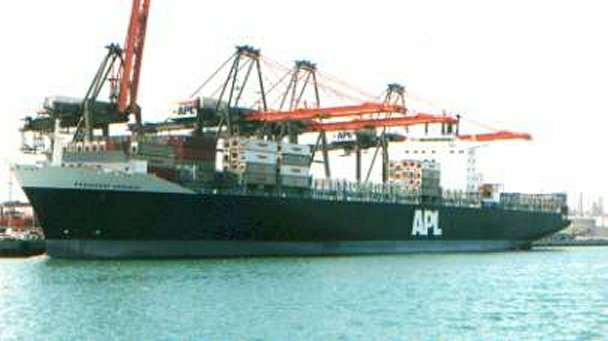 APL challenged this way of thinking in 1988 when it commissioned the first "post-Panamax" ships, the C-10s. Experts scoffed at spending $100 million to build a ship incapable of transiting the canal, but the wisdom of the new design soon became evident. In addition to being technological marvels with the latest in satellite navigation and safety features, the new ships can carry up to 30 percent more cargo than their predecessors, have a range of over 20,000 nautical miles, and can reach speeds of nearly 25 knots. And because intermodalism in North America meant that goods could be transported from East Coast to West Coast more effectively by train, it made sense to build ships that were committed to trans-Pacific trade. In terms of scale, imagine a ship just over three football fields long that carries more than 2,400 forty-foot containers - that's 2.4 million cases of bananas, or 4 million boxes of shoes, or 60 million blouses. 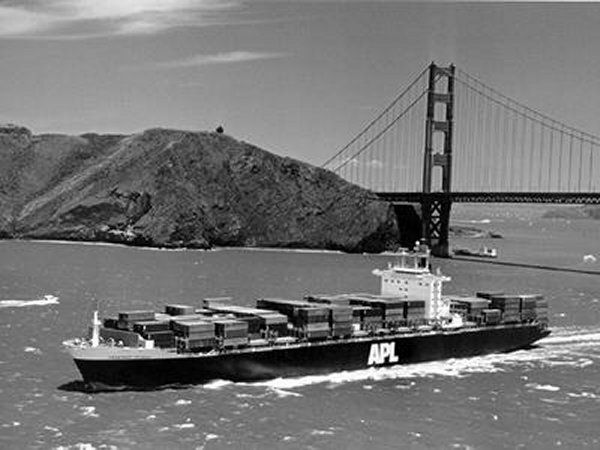 In contrast to the California, the first steamer of APL's earliest predecessor, the company's newest ships are a study in efficiency. 36 sailors were required to man the California, a 200-foot-long brigantine. The President Truman, a C-10 which is over 900 feet long, operates with a crew of just 21. So successful was the new design that soon after the first C-10 was launched, plans for the next generation of ships were made. By the time the C-11s debuted in 1995, most major carriers were converting their fleets to post-Panamax vessels. 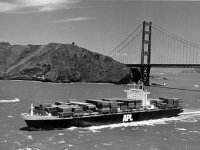 A fitting testament to the founders of what is now APL, these new ships are just the latest chapter in a history of innovation that spans a century and a half. 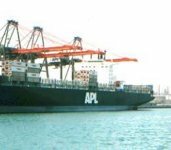 On 21 January 1997 American President Lines, Ltd., enrolled nine modern containerships in the new Maritime Security Fleet, completing the 47-ship program authorized by Congress late in 1996. 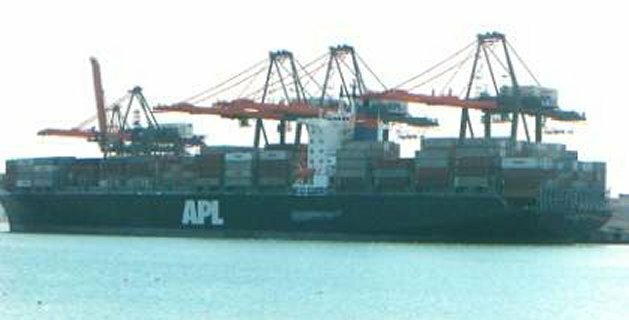 Like the other ships in the program, APL s ships will continue to serve international commerce in peacetime. In time of war or national emergency, the ships and the worldwide transportation system supporting them will be available to provide sealift support for America s armed forces. Ships enrolled in the Maritime Security Program include the U.S.-flag ships, Presidents Adams, Jackson, Kennedy, Polk and Truman, all built in 1988. Each can carry more than 4,300 containers. 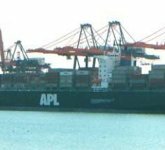 The President Polk is a large container ship built by HDW shipyard in Germany, for American President Lines, which is a subsidiary of American President Companies. The ship was built with a specific trade route in mind, that being between the US west coast and eastern Asia. 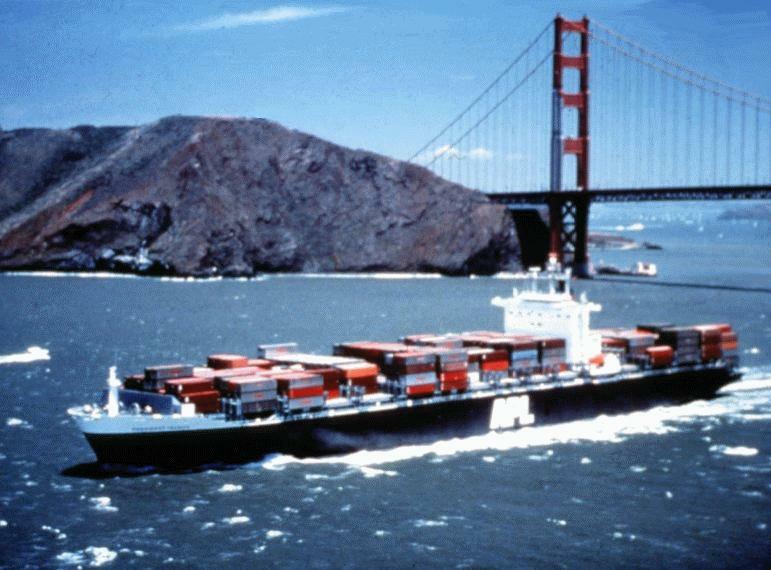 The ship entered service in 1992, and makes a regular run back and forth between California and Asia along with several other APL ships that are almost identical. The President Polk is a C-10 class [C10-M-F150a] container ship, which are among some of the worlds newest container ships. Some of its unique features which are not found on many other American flag ships are: Scoop cooler system instead of a main sea water pump for central fresh water cooling and an engine control room that is located outside the engine room. The President Polk has a design speed of @ 24.5 knots while carrying as many as 4600 twenty-foot equivalent length containers. The normal crew aboard the Polk is 21 people. The Polk has a deck house that is located about 150 feet forward of the stern. The control room aboard the Polk is located on the main deck of the house. Bremer-Vulkan, the shipyard that built the Polk, wanted to put the control room on the bridge, but APL paid extra to have the control room placed on the main deck. The main engine on the Pres. Polk is a Korean made Sulzer 12RTA84, which has a maximum engine speed of 95 RPM, producing a service speed of @ 24.5 knots. APL has a service contract with Sulzer to perform all scheduled maintenance on the engine. The total amount of Heavy Fuel Oil [HFO] burned while underway at sea, including HFO burned in the Ship Service Diesel Generators [SSDG], is approximately 160 tonnes/day. There are three MAK model 8M453C auxiliary engines aboard the Polk. The generators have a high enough electrical rating so one engine could handle the electrical load requirements of the ship, except when there is a large refrigeration load on deck.